So imagine my delight when one day a student uttered the most welcome words I had ever heard a Frenchy bestow upon an edible item from England. We were sitting together, eating in a local Paris bistrot (we have lunch with students to immerse them in English for the entire day/week, a task that can be joyous or depressing in the extreme depending on various later-to-be-mentioned factors) and I had just informed them from which country I hailed (I’m not sure why I am speaking like this. I do not teach my students to speak like this. I do not speak like this in real life. I think I am just getting a little vainglorious (haha! I looked up that word) because of what this French person said). So, we are sitting in the bistrot, I tell them I’m from England, I’m ready for the onslaught of jokes about English cooking, and that’s when the words came. “Ah, English milk”, beamed my student with a sigh of palpable pleasure. OK, so it wasn’t as verbally expressive as I’d have hoped for after a two-hour lesson on descriptive English, but still, it was a compliment and it was genuine and I grabbed it with both hands. At my request for her to elaborate she went on to describe how English milk was… good (again, not really the culinary or linguistic victory I wanted, but I beamed back in appreciation). It was a rare occasion, for not only had she said such a wonderful thing about one of my country’s comestibles, but she had said it in front of three whole other French people. They could not deny it. They had been witness to this revelation and I had been witness to their presence. They shuffled uncomfortably in their seats, uncertain they had understood. But there was no mistake. Compared to French milk, my English stuff was incredible. Not thin and milky, but rich and creamy. Produced in England and superior to France’s equivalent. Aha! Take that, France! Perhaps I am getting carried away. After all, milk is not really a culinary creation, it’s a liquid that comes out of a cow. And I’m not even that patriotic but this kind of comment is so rare that it brought me out in a bounty of internal ner ner ner ner ners. 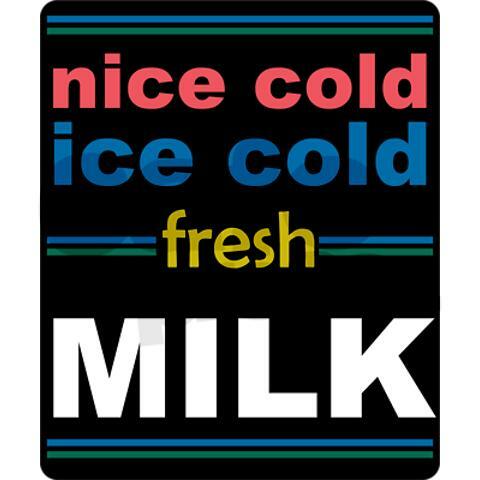 It also made me remember the wonder of fresh (English) milk. And crave it until I next went back to the motherland. Alone, it is a thirst quencher with noteworthy clout. It’s a meal and a drink in one. And even tea doesn’t come close as a companion for cookies. I don’t even have much of a sweet tooth but I’ll happily chomp on a whole bar of chocolate with a glass of the right milk. 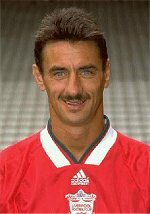 Ian Rush: Liverpool striker through the 80s and 90s. Advocate of milk. In the UK there were even ads for milk on TV. Its strength-building properties revered by a generation of small boys dreaming of becoming the next Ian Rush. And despite the wave of dairy doubters in recent years, it is still being enjoyed by many as a drink in its own right, not to mention an essential part of Britain’s most popular drink next to beer – tea. Which is why any respectable British fridge is a shame to its fraternity if it is lacking a pint of the fresh stuff. The French however, think we are weird to consume milk as a drink. Their perception of English people drinking milk is probably not too far from this. But they also make fun of Germans who drink milk with their lunch in company canteens (I have no idea if Germans in fact do this. Germans? Do you?). And I once heard a story about an American (yes, Americans drink milk too! Not that this will convince a Frenchman to change his ways. (Denmark and Greece are incidentally big fans as well.)) who opened some milk on a bus in Paris and drank from the bottle direct. He was glared at so disdainfully by his fellow passengers that you’d have thought he’d opened a bottle of vegetable oil and started glugging. Milk in France is really only for babies or cereal (anyone for a bowl of crunchy nut babies?). Oh, and coffee. But only in the morning. Some Frenchies add milk when making omelettes but many of them will look at you suspiciously if you suggest this practice. It is more of an ingredient than something to be consumed alone. They use a splash of it here and a nuage of it there. It is used in such small quantities that there’s no use in having a whole bottle of fresh in the fridge; it will just go bad. Which is why UHT is the predominant format of milk in this otherwise (do I really need to mention it?) culinary super-power (and even though you can find fresh milk here it’s still not a patch on the milk I grew up with). The demand for a better quality of milk is just not high enough. It’s why the American was practically shamed off the bus: the French don’t know just how delightful milk is when it’s good. But rather than preach to a people who know better than us plebeian Brits, whenever I am feeling inadequate in the face of a Frenchy, I will silently recall those magical three words mentioned by one of his countrymen: “Ah, English Milk”. This entry was posted on Sunday, December 4th, 2011 at 21:38	and tagged with Accrington Stanley, creamy, delicious, drink, England, English milk, food, France, Ian Rush, lait, milk, milky milky and posted in French Connection, humor, J'aime. You can follow any responses to this entry through the RSS 2.0 feed. Ice cold and creamy in the summer, yes. Hot with honey for a bedtime relax in the winter to aid sleep, yes. Added to cooking, the main source of custard, home-made with eggs or the powdered stuff. Essential in Yorkshire Puddings . . . rice pudding, creamy porridge . . . the list goes on . . . and on . . . and on. . . 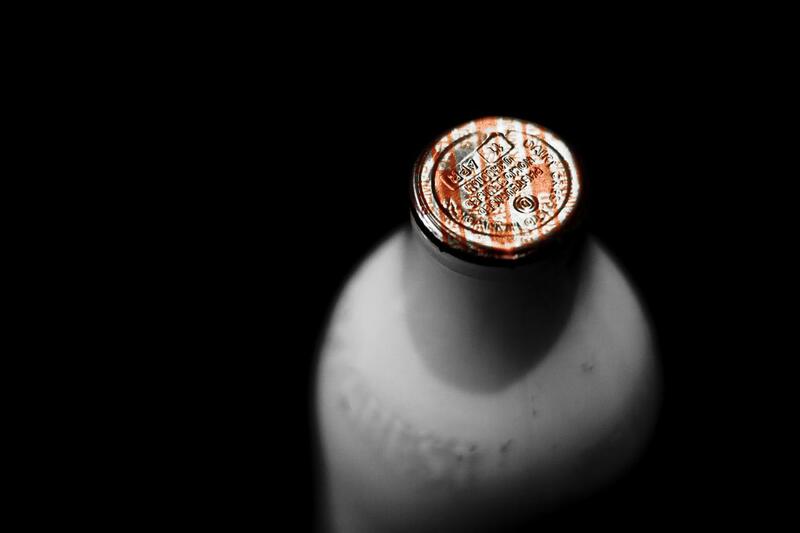 .MILK!!! Apart from the odd late night swig of it right out of the bottle and of course a glass of it with a PB&J sandwich it’s just an ingredient for me. But then, I’ve never had English milk. As always, an enjoyable read Denise. Great title for this one too. Keep em coming.